Have you always wanted a unique notepad for your business? Print notepads at Helloprint and impress your customers! 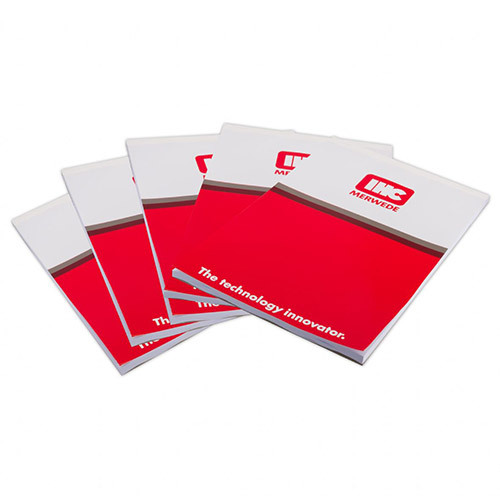 Our notepads are printed on the best quality paper and come in 8 sizes. The pages are printed on one side and there are no standard lines printed on the notepads. Would you like to have them on your notepads? Make sure you include them in your artwork. 3 Would you like to have boreholes? The holes have a mutual distance of 80 mm in accordance to the standard dimension. A notepad with glued cover is a bundling of multiple paper sheets, which get glued together on top or on the left side and have a cardboard backsheet and ofcourse a cover. Digital (up to 200 pieces): printed on HP Indigo professional printers, right after your order. Digital printing is cheaper in the lower quantities. For the delivery of your cover notepads we use multiple carriers. Because of the highest reliability, in most cases we use UPS or DPD. The cover notepads that is chosen in most cases can be selected via our website. On what sides can the Cover Notepads be fitted (glued) together? The notepads can be fitted (glued) together on both the left-side and on the top. 80 gsm offset: This is the most often-used paper for Cover Notepads. The thin paper makes it easy to tear off. Because of it's structure the Cover Notepads are perfect to write on. Reinforced cartboard: The back side is made from reinforced cardboard with a thickness of 1mm. 250 gsm gloss mc: This thick paper gives your notepads a robust and luxurious look. Is it possible to order the notepads with glued cover with boreholes? Yes, you can decide if you would like: no, 2, or 4 punched holes. These are very useful when you want to organise your notepads in a folder. The standard distance between the punching holes is 80mm (The European standard).